Several boil-overs in my extract days back in the mid-90's. Hop/wort gunk everywhere in the little stove in my row home. My all-grain debacle was last fall making a Pumpkin Ale with canned pumpkin (I usually use whole). I did not add enough rice hulls and the sparge stuck solid. My final attempt to save it was to disconnect the stainless strainer and strain it through a fine mesh bucket bag. So I filled the MT up with ice water which got the temp down to 125F which is still darn hot to the touch. I sanitized a garbage bag, put my arm in it and tried pulling off the strainer while yelping in pain from the heat. I finally managed to get it off, but the frayed wires tore the bag and filled it with hot, orange, pumpkin wort. After getting drenched with wort and having a red burnt arm I finally called it quits and tossed it. What a fiasco and mess! German Lagers, Pale Ales (IPAs) and Steam Beer. However I just counted and I've brewed 34 different styles to date so I guess I also like to expand my brewing horizons. Sour beer unless Kyle convinces me otherwise at the NHC. 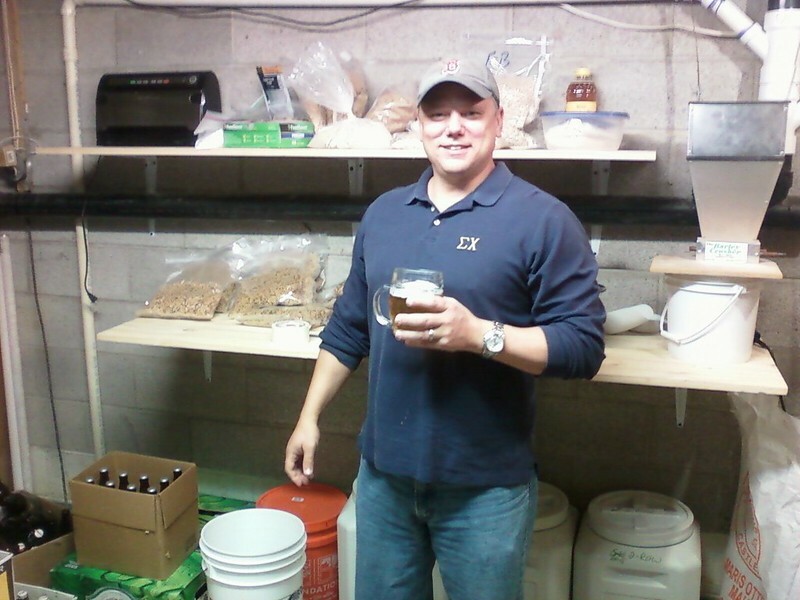 My first extract brew was "The Sun has Left us On-Time Steam Beer" from the Complete Joy of Homebrewing, 1991. It was really good and I was hooked. 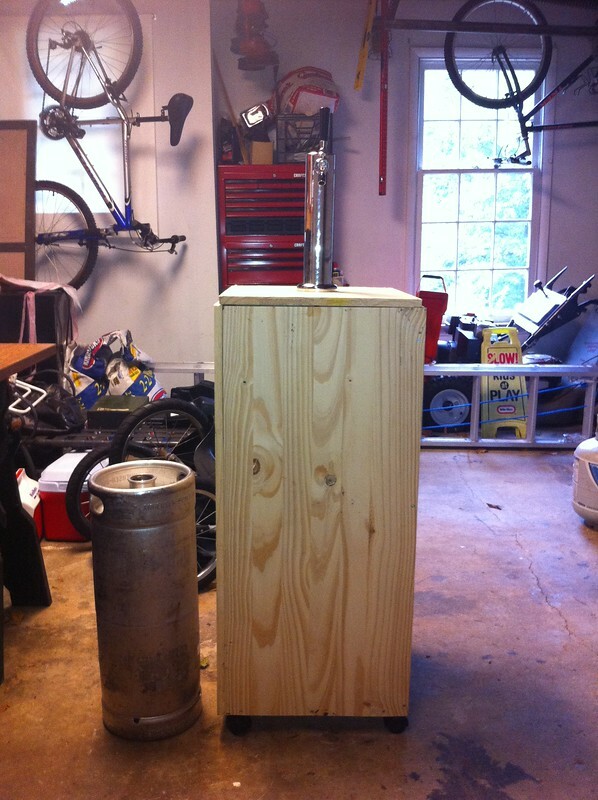 After a 7 year hiatus I brewed my first all-grain and that was a SMaSH Pale Ale which also turned out great. I was re-hooked. Nope. All of my mistakes have been complete disasters. I've dumped 5 of 120 all-grain brews and 4 were because I did something dumb. One was from bad yeast. I did however forget about a case of extract lager in my basement fridge for a year. When I was moving out I found it and it was awesome! I like my homemade sparge arm too. Basic gravity system with 2 home depot coolers. 15G kettle and Bayou Classic burner. I try to brew weekly but it ends up being 2-3x/month. My favorite yeast is White Labs 037. It imparts a distinctive nutty, sharp flavor that I have not found from any other strain. Truly a unique, super yeast. Will you be at the NHC? Yes and I hope to share a brew with many of you whom I learned from and talked with over the past 2 years on the forum. Benjamin Franklin. It is well known he loved his beer and living in Philly for over 20 years I have learned a lot about him. He was also a master diplomat and outright genius so I think the conversation and stories he could tell would be quite riveting and fun. I would serve my Ben Franklin Revolutionary Red Ale (recipe to be formulated). Horseradish Paste in my Winter Fest. This year's NHC is my first competition. I have entered 4 styles. I typically brew alone unless I am making a style for a friend. Then we brew it together and they take home a case (they have to bottle it though). I also host an event called "Man Day" twice a year. I boot out the wife and child for an afternoon and invite over 15 or so of my buddies. I ask for suggestions for style and one guy gets to make the beer (with a little supervision) and take some home when it's done. For holiday Man Day, I trade 5G of my famous Guiness Clone with my buddy who is a certified Whiskey Master for a bottle of high-end single malt. Everyone brings their favorite whiskey to be evaluated and discussed. After the whiskey tasting, brewing, cigar smoking and trash talking is done, the wives are invited back for a party which typically goes in to the wee hours. I love Man Day! I like to fly sparge in my garage when it's warm enough. 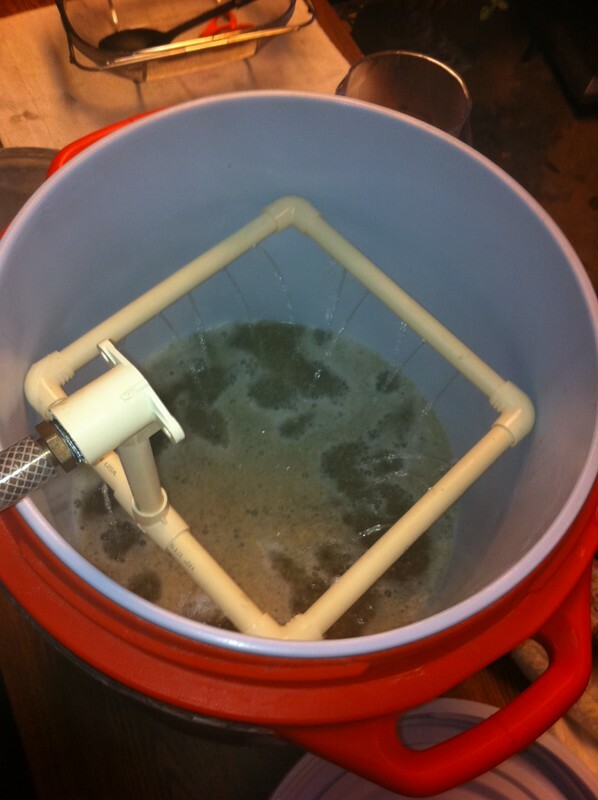 If it's too cold I'll batch sparge in my mud room. I have to boil outside no matter what though. I’m kinda lame with the beer naming. I typically just put a “Z” in front of the name of the style like Z-ESB, Zurquell or ZAIPA. I grew up being called Zacher or “Z”. If there is a good one from this it’s possibly “Z’s 10 Gallons of Lager Goodness”. However, I name the beers for the friends I brew them for after them: Steve Miller-Steam, Ray Ray’s Honey Oat Stout, Big Don’s Becks, Butch-Urquell, Mr. Ed’s Nut Brown Ale and my personal favorite since my brother is a priest: Father Pilsner. I also seem to be a spaz and cannot get the pictures in the post. If anyone could help, I'll buy you a beer at the NHC! I see a rather spazy link in the code with a double http:// -- I tried to copy it here but the forum software tries to interpret it.-- Use the insert image button and make sure you delete the http:// that the forum puts in there by default. Thanks Jimmy! I owe you a beer! Yea, I figured it was time, this being my first NHC and all. I really look forward to meeting everyone in person. I hope you will be there? We have shared posts on a lot of topics! Unfortunately I will not be there! Maybe next year... Would like to meet! See you at NHC Dave! Thanks Paul and Red. Looking forward to meeting you guys at the NHC.